Rafael Hernandez addressing the Cuban Futures Conference opening plenary “December 17th and beyond” Embassies have opened in Havana & Washington, the Miami 5 are free, Cuba is off the terrorist list and Obama and Raul Castro shook hands. What’s next? 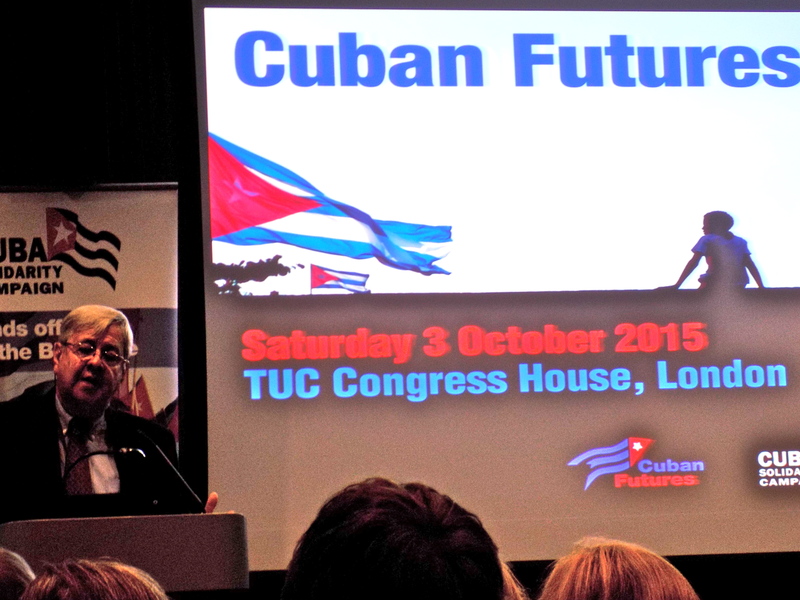 Members of the Socialist Labour Party attended the Cuban Futures Conference held at Congress House, TUC HQ in central London last Saturday, October 3rd 2015. The original Socialist Labour Party was set up by James Connolly who was also at one time a member of the Independent Labour Party (ILP) alongside Keir Hardy. The name was revived in 1996 as a response to the removal of Clause 4 from the Labour Party’s constitution under Tony Blair. The leader of the SLP was, and still is, Arthur Scargill. This took Connolly’s Socialism on board and setting a distinctive tradition strongly opposing the social-democratic and neo-liberal trends in both the Labour Party and politics in general. 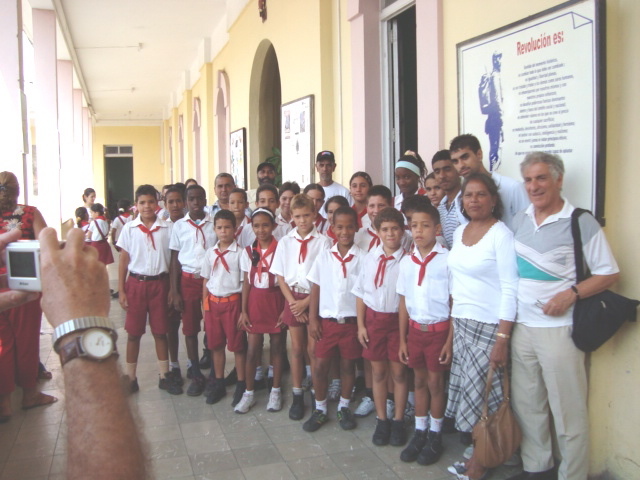 The SLP has been involve in two delegations to Cuba in the last decade. 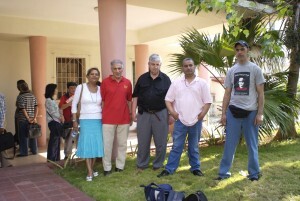 The first in 2008 was to attend the Conference Marxism in the 21st Century in Havana. It was then I became very much aware of a different perspective at work which was not confined to Cuba, but was having a far reaching effect on South American and Caribbean countries determined to counter the effects of their dominating neighbour to the north, the USA. 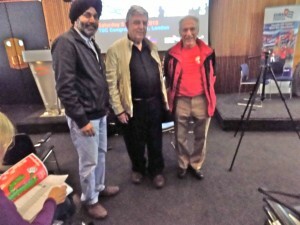 Four years later it was apparent that joint organisations being developed like ALBA (Bolivarian Alliance for the Peoples of Our America) were gaining momentum with Venezuela and Bolivia having elected Socialist governments and many others supporting the Cuban position, including Brazil and Argentina. Equador and Nicaragua also became prominent with their Ambassadors speaking at the London Conference giving testimony to Cuban achievement and leadership. 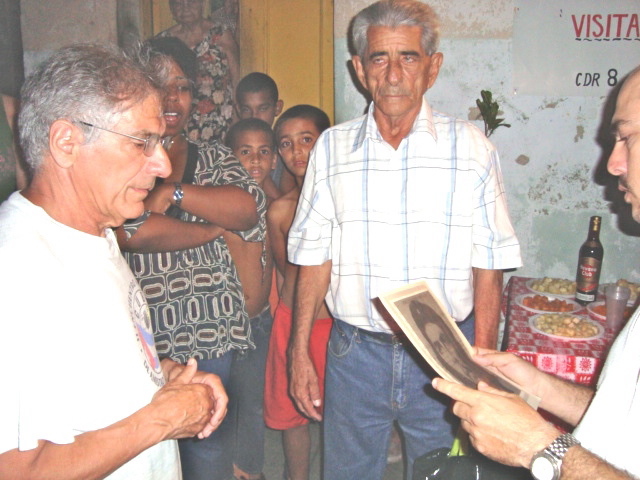 No one claims, least of all Cubans themselves, that they have found answers to issues confronting the world and humanity, but as speakers from a variety of backgrounds illustrated how Cuba was succeeding in many ways better than far wealthier states in health, in education, in food production and so on. This was against a backdrop of continuing sanctions in spite of the recent apparent thaw in diplomatic relations between Cuba and the US. Cuban speakers made it clear that they didn’t see a change in the United States intentions, rather a different approach characterised by “charm” rather than aggression. One told us the story of the frog and the scorpion when the latter, incapable of swimming to leave Cuba, asked the frog to carry him to the US. The frog replied that the scorpion would use its sting on him, to which the scorpion replied that he would drown if he did that. Half way across the scorpion did sting the frog who asked in surprise why he had done it. “That’s what scorpions do” came the reply. Cubans are seeking five major outcomes from the rapprochement with the US, including the return of Guantanamo Bay. 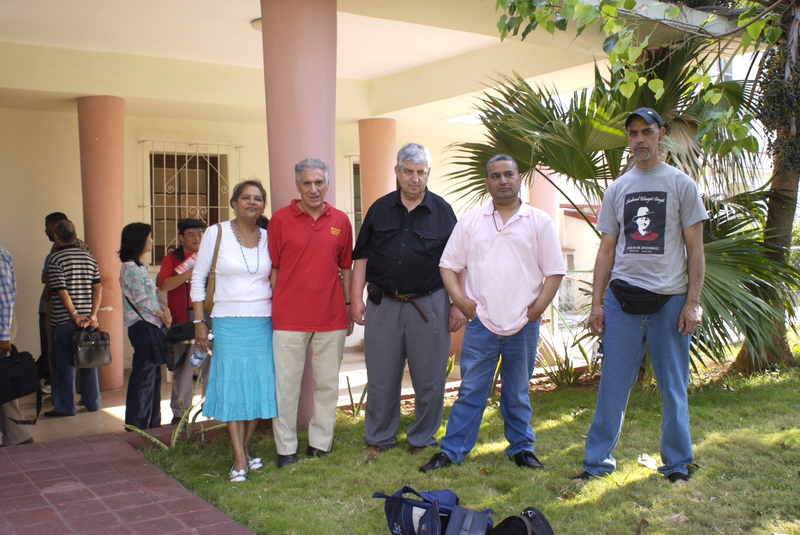 The release of the Cuban 5 from their long incarceration is seen as a major step forward, but on other other hand Cuban demands that the perpetrators of the terrorist act in bringing down a Cuban airliner, living in the United States, had not been brought to justice. 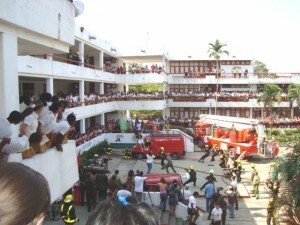 The five Cubans were arrested after their attempts to do just that. Cuba is characterised as a dictatorship and undemocratic by the standards of western governments with multi-party systems. However this needs to be countered by understanding how people are elected to govern at three levels: local, provincial and national. In practice it is far more democratic by being inclusive with a far higher level of voter participation normally found in the so-called western democracies. John Mcleod receiving gifts, including a portrait of Che Guevara, from a street committee in Santa Clara, Cuba, on behalf of the Socialist Labour Party in 2008. The SLP delegations have been welcomed on each of their visits by local communities with festivities taking place in the streets or buildings where they live. Doctors, teachers, police and others involved in provision of services are involved as are members of the community of all ages. In Santa Clara and Havana we were treated to street theatre, dancing and delicious local products including food and wine. Schools and clinics we visited were not lavishly equipped but clearly they manage to carry out excellent work. Gifts of even basic commodities were received gratefully. As the Cubans we met pointed out “we have little, but what we have we share”. Visit to a centre for young people here seeing services demonstrating a rescue exercise. Fidel Castro used to visit regularly on his birthday. The Conference was against a backdrop of events on and after 17th December, 2014 when there was an apparent thaw in relations between Cuba and its powerful neighbour to the north, the United States of America. Later in April 2015 President Obama announced that Cuba is of the list of state sponsored terrorists. So what of the future? How far have things changed? Cuban speakers were cautious believing that what they were seeing was a change in tactics by the US rather than a fundamental shift in their attitude to Cuba, aggressive posturing being replaced by a charm offensive. Cuba they still see as an undemocratic dictatorship as a one party state. The gains of the Revolution will have to continue to be defended, including “health, internationalism, educations, women’s rights”. Others, including the US can learn much from Cuba. 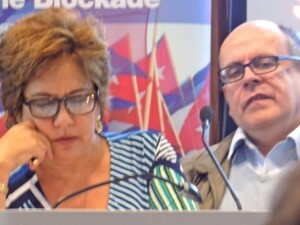 Arleen Rodriguez with translator on Cuban Futures. The return of Guantanamo Bay remains unresolved as does the Blockade and compensation for 50 years of aggression. It was felt that the support of many South American and Caribbean countries was instrumental in convincing the US that a new approach was necessary, as was world solidarity seen here today. It was noted that Obama still talks about “trading with the enemy” while Kerry referred to the relationship as “neighbours” rather than “friends”. 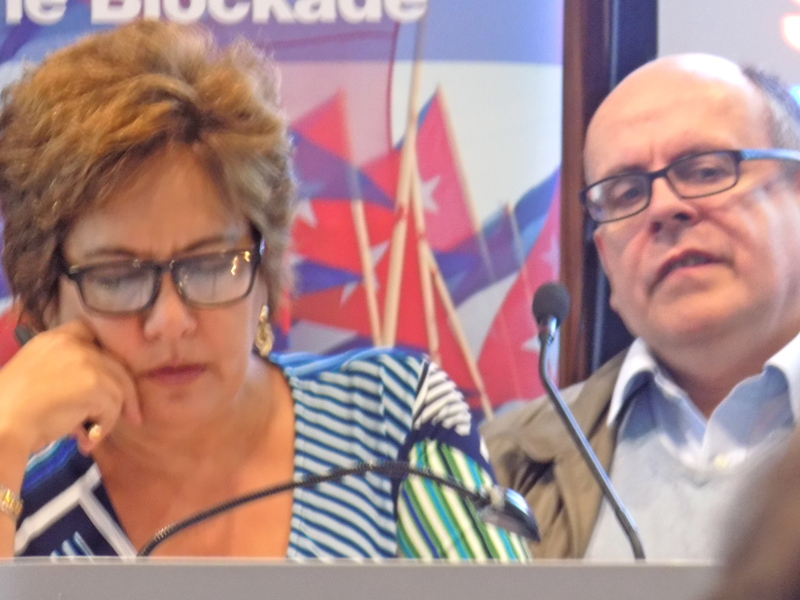 A resolution to end the blockade will be taken to the UN. How will the Obama administration vote? Cuba will not be going cap in hand but proceed with a dignified conscience to maintain a dignified sovereignty based on a record of solid achievement. This entry was posted in International, Latin America and Caribbean, Politics, United States on October 6, 2015 by John. US Defence Secretary John Kerry is asserting that “Israel has the right to… defend itself”. What does this statement imply given the information that is now coming in from Gaza. Are the sophisticated weapons held by Israel, bank rolled by the US, supported by other western governments defence weapons consistent with defence? Earlier attacks on Gaza using white phosphorus and depleted uranium made commentators ask if the Israeli defence industry was using the residents of Gaza as guinea pigs in the use of new and increasingly deadly technology. Do they believe their own propaganda? Israel believes it has the right to flout international law, and does so with impunity. It holds a stockpile of nuclear weapons and continues to hold Mordechai Vanunu in Israel against his will for telling the world they were held at Dimona, supposedly a textile factory. Vanunu believes that nuclear power is dangerous for the future of the world whoever holds them. Israel’s secrecy compelled him to speak out. Now we hear NATO deploys Israel’s non-existent nuclear war heads on submarines gifted to Israel by the German government. This would give Israel the capability of a nuclear strike anywhere on the planet. US President JFK was strongly opposed to Israel’s possession of nuclear capability. Israel takes the right to confiscate Palestinian land, to demolish Palestinian houses and olive groves. Yael Dayan, former member of the Knesset and daughter of the Israeli General Moshe Dayan, believes Israel should return to the 1967 borders. I had the pleasure of meeting her in Tel Aviv in 2004 when she spoke passionately about peace and the rights of Palestinians. Israeli leaders believe they have the right to do whatever they want, and because there is little said by their partners in the world of big finance they get away with – well literally – murder. Genocide. How long can world “leaders” sit by staying dumb particularly when the people they are supposed to lead rise up and demonstrate their concerns about the treatment of fellow human beings in the Israel apartheid state. This entry was posted in International, MIddle East, United States on July 20, 2014 by John. Fidel Castro speaks out about the duty to prevent nuclear war. Fidel Castro has broken a long self-imposed silence in the Cuban journal “Granma” by drawing attention to the consequences of a nuclear war starting on the Korean peninsula. He speaks as a friend of North Korea and reminds them of ” a duty” to prevent that happening. Castro similarly spoke out when another potential threat to humanity, as Castro sees it, was under discussion: the environment. Few politicians I can think of have the understanding, authority and wisdom shown by Castro. The United States still mark him out as a danger to the world. As for understanding the two Korean states we have little chance of doing that from press reports, any more than we have been unable to see what underlies Iraq, Afghanistan, Libya, Syria, Iran, Egypt, Israel and so on. We only begin to understand when it is too late so that Sunni and Shia communities are at each other’s throats following the intervention of dominating world powers have intervened. The legacy of imperialism and empire are not buried and dead, they are very much with us. Humanity as a concern is way down the priority list for them, so to see Castro speaking out comes as cool refreshment. Clearly he is addressing North Korea as much as the United States and all who could play a part should conflict break out. 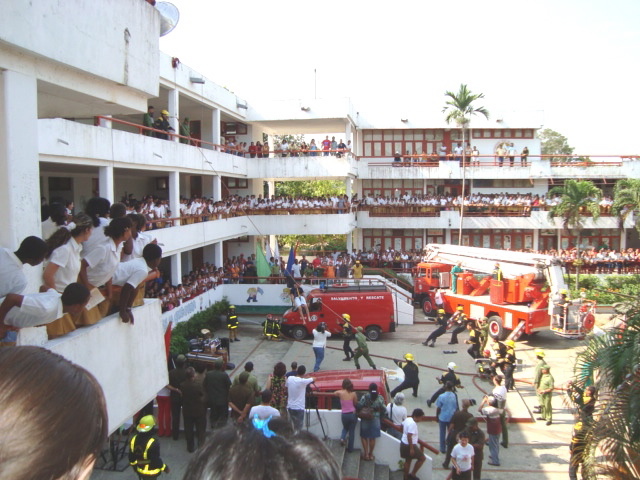 This entry was posted in Asia, International, Latin America and Caribbean, United States on April 7, 2013 by John. Did anything result from Obama’s visit to Israel and Palestine? One group of Israeli protestors thanked Obama for supporting the “Israeli Apartheid State” on his recent visit. So did Obama achieve anything other than bolstering the US/Israel relationship which gives Israel billions to arm itself to the teeth and occupy and confiscate Palestinian territory at will? One thing has happened since is that Israel has made an apology to Turkey of some kind for the deaths of 9 Turkish activists in 2010 when the Mavi Marmara was attacked en route to Gaza. A report claims that Israel needs some friends to avoid total isolation in the region. It appears that it was a phone call to Israeli Prime Minister Benyamin Netanyahu from Obama which brokered the deal. What’s on the other end of the deal we can only imagine. A strike by Israel on Iran? One thing is certain it won’t be cheap, and Palestinians remain under blockade in Gaza, their properties at risk from confiscation by Israeli authorities or constant attack from extremist Zionist settlers. On the israeli side the visit was highly orchestrated as Obama was given a history lesson as he visited the holy sites of Israel’s past. Palestine has no part in this, and if those like Daniel Pipes is to be believed no future. Through the visit Obama addressed both Palestinians and Israelis. On the one hand he emphasised that the Jewish state of Israel was inviolable “as the strongest state in the region” backed up by the power of the United States. On the other he spoke of peace and a two state solution. Seizure of Palestinian land was counterproductive if that was to become a reality. So Israel will continue to occupy territory and seize Palestinian land. It is now so small and fragmented that the idea of a separate state is unimaginable as things stand. A withdrawal to the 1967 borders, once touted widely, seems highly improbable. I can think of nowhere where states become overtly religious where there is room for people to thrive in equality. People of different background and beliefs can and do coexist, and have done for centuries. Political intervention quickly undermines this so sectarianism takes over. The precondition of a religious state, whether Jewish, Islamic or Christian cannot lead to people living together in harmony. Obama’s message to uphold a state devoted to one exclusive group will not work here or anywhere else. He came and went satisfied with a token gesture, otherwise business as usual. This entry was posted in International, MIddle East, United States on April 3, 2013 by John. Polling day in the U.S. Two candidates too close to call which goes for their policies too. This is unsurprising since it’s not the voters who call the shots, but the huge economic and hence political might of the big corporations who fund the big two names. As far as most are concerned they are the only ones running. Russia Today took the step of producing hustings for some of the others raising issues not covered elsewhere. I note that the Green Party Candidate has been roughed up by the authorities for espousing off message sentiments which don’t accord with corporate wishes. As we have seen the 99% of the country feel they’re unrepresented but the corporate agents use unrestrained force to break up protest. Again Russia Today reports on chaos in Florida before voting begins. Early voters are caught in never ending queues and end up giving up. This entry was posted in International, United States on November 6, 2012 by John. Last week, Friday, I took a train from the Hawthorns park and ride station, just out of Handsworth, changing at the next station down, Galton Bridge, for a train to Shenstone, near Lichfield. One more change at Aston and I was soon there. At Shenstone there was already a gathering in the car park, including the organisers of a vigil, members of the local Methodist Church and a number friends and acquaintances concerned about the issue we had assembled to confront – peacefully of course! Just three minutes walk down the road is a factory, an unassuming building on an industrial estate. The place didn’t seem active at all as there was no sign of movement within. At the site 40-50 people gathered on the narrow grass verge with assorted placards pointing out the results of what was being manufactured here. UAV engines seems innocuous enough except when you realise UAV stands for “Unmanned Aerial Vehicles” or drones, one of the latest developments in global warfare. Here operators sitting at a safe distance from their target play what look like a computer game to strafe their target. In reality it includes the killing of people, men, women and children alike. Civilians in Pakistan, Somalia,Yemen and Afghanistan are among the recipients. 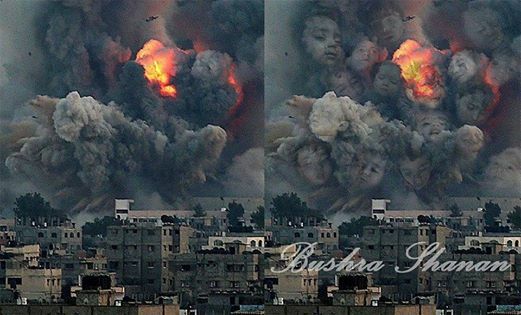 The perpetrators include the US, the UK and Israel, who are prominent in the development, manufacture and use the weapons significantly against the people of Gaza. The section on their products leaves no doubt of the intended use: “one trip lethal UAVs”. The Palestinian was prominent on the vigil. The hour-long programme consisted of remembering the victims of drones, as well as those associated with their use. Prayers and thoughts were interspersed with 10 minutes silence ended with the sounding of a bell. When the Church leaders took a letter to hand in to the company the door remained firmly closed. The place appeared empty without a sign of movement through the windows. Only a police vehicle stood in front. Eventually a police officer came across to speak to the leaders. The vigils are held regularly every 3 months or so. Concern about wars and the use of indiscriminate and sophisticated weaponry attracts increasingly widespread concern. This entry was posted in Birmingham, UK, International, MIddle East, United States on May 20, 2012 by John. The solution to the banking crisis. Simple just put the bankers in charge stupid! The new leaders of Greece and Italy, ravaged by never ending debt, are from the very institutions that got them to borrow and borrow like there was no tomorrow. New the EU is “solving” the crisis by letting them lose to create even more unimaginable debt. Will it work. The Keiser Report on Russia Today thinks not, but the damage on the way will be heavy to say the least. Ten years or so back banks were regulated to some degree, but now the big five financial institutions in the US are exempted from regulations. Ten years back these bankers would be in prison for stealing our money, but they have used the spoils to buy off members of the US Congress and have become untouchable. A small elite who can dictate their terms. Meanwhile the 99% protesting at what is happening are finding the full force of the state coming down on them as tent cities are cleared away and peaceful protestors are getting pepper sprays an worse. Elderly people and veterans are getting caught up. An 84 year old woman was sprayed and two ex army veterans have been seriously wounded . Why aren’t the police protecting the people? Presumably because their bosses, like Mayor Bloomberg in New York, are also representative of the wealthy elite and give the police their orders. In the UK the Anglican Church has spoken out on the effect cuts are making on the most vulnerable and asking the government to think again. This entry was posted in Big bucks, Europe, International, United States on November 19, 2011 by John.